Laia Alonso Marmelstein ’19 (left) and Veronica Switzer-Poplar ’19 started development on the app Migraine+. Photo taken by their partner, Kelly Nirenberg ’20. For the majority of her life, Kelly Nirenberg ’20 has suffered the debilitating effects of migraines. She has often been disappointed with doctors’ visits and their advice on how to cope with her pain. 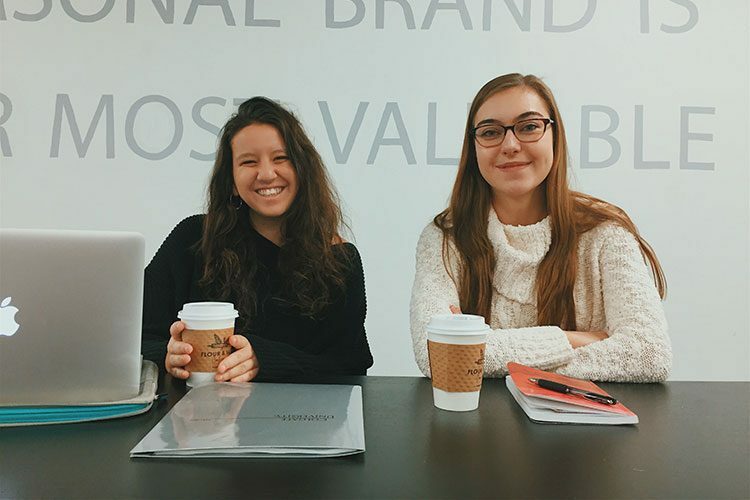 So, when Laia Alonso Marmelstein ’19 and Veronica Switzer-Poplar ’19 reached out to Nirenberg to ask if she would be interested in taking part in their venture, Migraine+, Nirenberg enthusiastically joined in their efforts. Through Colgate’s Thought Into Action (TIA) entrepreneurship program, the three have been developing Migraine+, an app that walks migraine sufferers through their symptoms and offers assistance in the most critical moments. The app offers migraine sufferers immediate responses as well as personalized remedies and treatments. After Alonso Marmelstein and Switzer-Poplar fashioned the prototype last fall, they, along with Nirenberg, held a focus group with students to learn more about how migraines affect sufferers’ days. During the meeting, the group presented their prototype and described its features, such as personalized e-mails for professors and employers. “The group gave us a great indication of their routines when they have migraines, which brought a fresh perspective on what features to improve and take out,” Nirenberg said. This spring, when Alonso Marmelstein (a neuroscience major) and Switzer-Poplar (a biochemistry major) studied abroad, Nirenberg stepped up to further develop the app. Although she had no prior experience with entrepreneurship, “Migraine+ is something I am extremely passionate about,” said Nirenberg, who is an English major. Nirenberg worked closely with her mentors at TIA this semester. “They were really helpful and were with me every step of the way,” she said. “They helped me realize I was capable of pursuing the entrepreneurship route.” She added that one aspect her mentors helped her with was providing a bigger picture of what Migraine+ could be. To promote their venture, Alonso Marmelstein, Switzer-Poplar, and Nirenberg are using social media platforms, blogs, and existing support groups. They are also in the process of partnering with local neurologists and plan to reach out to different migraine doctors and associations, such as Migraine Association of America. According to Migraine.com, there are more than 37 million migraine sufferers in the United States. Of those, 5 million suffer one or more migraines per month. “I liked [the idea of] helping other migraine sufferers because I want to make an impact on those who suffer even more than I do,” Nirenberg said.